It is time once again for students from the University of Minnesota to contribute to the MNPR Blog as part of their Journalism 3279 class. 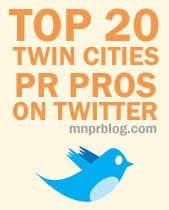 They will be contributing not only to the MNPR Blog, but also to the Minnesota Student PR Blog. I am always excited to hear from students. I hope you enjoy reading and that you will leave some good comments.